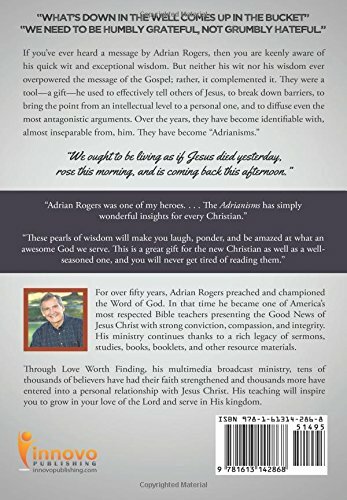 ABOUT THE BOOK: If you’ve ever heard a message by Adrian Rogers, then you are keenly aware of his quick wit and exceptional wisdom. But neither his wit nor his wisdom ever overpowered the message of the Gospel; rather, it complemented it. They were a tool-a gift-he used to effectively tell others of Jesus, to break down barriers, to bring the point from an intellectual level to a personal one, and to diffuse even the most antagonistic arguments. Over the years, they have become identifiable with, almost inseparable from, him. 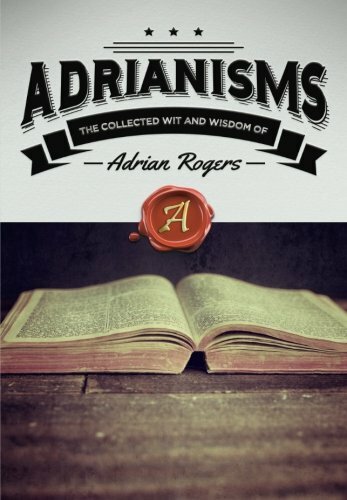 They have become “Adrianisms.” **** ABOUT THE AUTHOR: For over fifty years, Adrian Rogers preached and championed the Word of God. In that time he became one of America’s most respected Bible teachers presenting the Good News of Jesus Christ with strong conviction, compassion, and integrity. His ministry continues thanks to a rich legacy of sermons, studies, books, booklets, and other resource materials. Through Love Worth Finding, his multimedia broadcast ministry, tens of thousands of believers have had their faith strengthened and thousands more have entered into a personal relationship with Jesus Christ. His teaching will inspire you to grow in your love of the Lord and serve in His kingdom.